The spring snow melt and runoff triggers many natural reflexes in man and nature. In the Truckee River, the runoff historically triggered a migration of trout that was known throughout the West. Industrial uses of the river and over fishing led to the ultimate demise of the native trout population. The newspapers of the late 1800's and early 1900's carried many articles regarding the destruction of the Lahontan cutthroat trout. A good day of fishing. 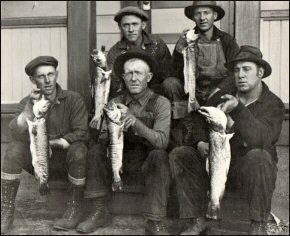 These Truckee men proudly display the day's catch from the Truckee River. Fish such as these became hard to find in the Truckee River as the Lahontan Cutthroat Trout slowly became extinct. When John C. Fremont first discovered and named the Truckee River in January of 1844, he called it the Salmon Trout River. He found the Pyramid Lake sub-species of the Lahontan cutthroat trout that grew up to four feet long and weighed forty pounds. Fremont commented " their flavor was excellent--superior, in fact to that of any fish I have ever known." The trout relied on the Truckee River and its tributaries for their spawning runs in spring, traveling up the entire river's length as far as Lake Tahoe and Donner Lake, where they used the cool, pristine waters and clean gravel beds to lay their eggs. The Paiute and Washoe people relied on the trout and also the cui-ui, a sucker fish that lives in Pyramid Lake and spawned in the lower Truckee River for their traditional food supply. While the Comstock Lode and its major mining operations of the early 1860's began to disrupt the natives way of life, they continued their practice of spearing and smoking the fish. They found they could make a living by selling the fish to the miners. They had always built fish traps in the river and streams at spawning time, and caught tons of fish. Very quickly, white fishermen followed the natives example and started major operations. The fishermen built bigger traps, used basket nets, and even used giant powder, an early form of dynamite, to catch thousands of fish each year. By 1869, there was an attempt in both the Nevada and California Legislatures to regulate the fishing industry, as the destruction of the fish run had become very noticeable. Even though some laws were eventually passed, enforcement was nonexistent. At Lake Tahoe, Donner Lake, and Independence Lake, a lake variety of Lahontan cutthroat trout, known as the silver trout, were using the feeder streams and outlet rivers to spawn in. They too were trapped, speared, and netted in large numbers. Charles F. McGlashan visited a Washoe fish harvest in 1878 and noted that they were catching 500 pounds per man per day. They were spearing fish just 400 yards up McKinney Creek, and most other streams had camps on them. They were shipping and carrying fresh and smoked fish to Carson City and Virginia City. The trout were a food staple and favorite menu item in restaurants and homes around the west. Once the railroads expanded and Truckee River ice was available for keep them fresh, the markets of Sacramento, San Francisco, Salt Lake City, Los Angeles, and Denver were stocked with Truckee River trout. While the markets demanded fish year round, both river and lake fishing was a seasonal occupation. By 1871 over fishing was noted as a major concern to the fishery. Trout raising in artificial ponds became a local industry. Dams for irrigating the arid Nevada valleys had been built as early as 1861 in the Truckee Meadows. Irrigation ditches siphoned off water from the river, affecting the fish survival. Early dams had ineffective fish ladders, if they had any at all. The dams and ladders were perfect places for fishermen to spear and net the congregating fish. As the demand for lumber increased after the completion of the Central Pacific Railroad over the Sierra, sawmill dams began to be built on the river. As many as fifty dams were built from Lake Tahoe to Verdi in the timber belt alone. More were built on tributaries such as the Little Truckee River and Prosser Creek. In March of 1871 the Nevada Legislature enacted laws that allowed only catching fish in the Truckee River by hook and line. The law excluded the Paiute and Washoe, so they were hired to fish for white businessmen. It also required that fish ladders be installed on the dams, but the law was not enforced. In April of that year Renoites went down river to Wadsworth and proceeded to blow up a dam that was blocking fish migration. The California Fish Commission furnished mill operators with a detailed model of fish ladders for their dams. Prosser Creek iceman Benjamin B. Redding was the Truckee River Fish Commissioner, and had successful ladders installed on his ice dam on Prosser Creek. Even with these efforts, the trout were unable to spawn in enough numbers to sustain the run above the California state line. Fisherman fought with each other to position themselves at these ladders to catch the most fish. Another problem that the fish faced was the continued dumping of sawdust from the sawmills that were built on the river, and along side streams. At times the sawdust was so thick that fish couldn't swim in it. The sawdust covered up gravel spawning beds in the lower river and contributed to algae growth that polluted the river. A large sawdust delta or bar had formed by 1874 at the inlet at Pyramid Lake, that prevented the fish from running up the river. The inlet of the river even changed course and the Truckee River flowed into Lake Winnemucca. Upstream mill operators denied that the sawdust affected the fish in any way. The California Legislature even declared that sawdust wasn't harmful to fish. Extensive logging, sheep and cattle grazing, and soil disturbance contributed large quantities of sediment to the river, smothering the spawn beds, and building up banks of silt behind the many dams along the river. Runoff was sped up as the lack of tree cover allowed the snow to melt faster and runoff to surge through the river system. Lumber flumes and chutes were lubricated with tallow, dogfish oil, or rancid butter, and this added to the pollution. Even with fish laws and public outcry, dams continued to be built. A large dam on the Truckee River without a fish ladder was built by Jack Foulkes at his sawmill at Verdi in 1875. This dam stopped almost all trout from migrating up the river. Those that did make it by faced another large dam at the Pacific Wood & Lumber Mill at Clinton, next to present day Hirschdale. No native fish made it up to Truckee from 1875 until 1878 when the Foulkes dam was opened up. In 1875, the native fish stocks were so depleted above Verdi, that the California fish Commission released the first foreign fish species. Eastern brook trout and whitefish were planted in the Truckee River above Boca. These fish were successful in the river and competed with the few native trout able to make it over or around dams. In later years, German brown, McCloud River (Alaska) trout, kokanee salmon and catfish were also planted in the river system. In 1880, the total disappearance of Lahontan cutthroat trout above Verdi was noted. Even as that happened, over 140,000 pounds of trout a year were being harvested at Wadsworth. The completion of more irrigation ditches in the Truckee Meadows caused summer flows to drop dramatically. Pyramid Lake also began to shrink, making it more difficult for the fish to migrate out of the lake. Another dam was erected on the river near Wadsworth and predictions were made that the fish would soon be completely wiped out. The Nevada Legislature continued to pressure California to outlaw the dumping of sawdust in the river, even as it refused to stop construction of new dams. Nevada continued to allow the commercial harvest of fish, and encouraged more water diversions from the Truckee River. Nevada still did not require fish ladders on dams, while California did. Reno's waste was dumped in the river causing more problems for the fish. The Lake Tahoe population of trout was able to survive due to California fish laws that restricted fishing during spawning season, and prohibited fishing with anything except hook and line. However, in 1887, Mackinaw (lake) trout were planted in Tahoe. The Mackinaw were direct competition to the cutthroat trout and would soon become the dominant sport fish in Tahoe. The mackinaw also carried a parasite with them that depleted the native trout. The lake subspecies that were in Donner and Independence Lakes were also killed off by competition from foreign species and by dams at the outlet of the lakes that reduced their spawning grounds. By 1890, annual restocking of non-native fish in the Nevada portion of the Truckee River was the only way that any fish population could survive. Continued dam building, irrigation ditch river diversions, flooding, mudslides into the river, politics, and ineffective fish law enforcement all contributed to the reduction of the Lahontan cutthroat trout in the Truckee River. Federal approval of expanded desert land reclamation contributed to the problems. The fish that were planted in the California portion of the river were washed downstream and the lack of fish ladders prevented them from returning upstream. California stopped planting fish in the Truckee River in 1896. The turn of the century did not improve conditions in the river. In 1900 the Floriston Pulp and Paper Company mill was constructed along the Truckee River between Boca and Verdi. The mill dumped excess pulp and acid into the river further polluting it. Power plants along the river were constructed adding to the problem. An oil spill from the Truckee yards of the Southern Pacific Railroad spread oil down the river to Reno. In 1905 the Derby Dam above Wadsworth was built, and more water was siphoned out of the river and Pyramid Lake. The Pyramid Lake subspecies of the Lahontan cutthroat trout finally became extinct in the Truckee River system about 1940. Fortunately the Walker Lake subspecies managed to survive, and this population was adaptable to the Truckee River, so it was planted in large numbers. Recently the Walker Lake subspecies has become threatened by water diversions, similar to what happened on the Truckee River decades ago. By the 1950's the problems that contributed to the river degradation had diminished. Forests were beginning to grow back in clear cut areas, the Floriston paper mill had closed, the old dams had been washed away, the sawdust of the old sawmills had been washed into Pyramid Lake, fish laws were stricter and were being enforced. However the native trout were gone, replaced by planted species that have adapted well. In current times, an experiment to reintroduce the cutthroat trout into the river system is being tried. Time will tell if history can be reversed. This article written by Gordon Richards originally appeared in the April 30, 2004 Echoes From The Past column in the Sierra Sun.